Serving fine Northern Italian fare with flavors borrowed from all over that country, Cafe Juanita in Kirkland maintains a high level of excellence established by chef Holly Smith. Well-trained staff bring fresh pasta, rich fish and meat dishes and dainty desserts to well-laid tables. Almost immediately, she did, earning 3½ stars from Nancy Leson in this newspaper that same year, gathering accolades from the national press, and winning the James Beard Award for Best Chef Northwest in 2008. Smith has unequivocally made Cafe Juanita her own, gaining confidence as a proprietor and maturing as a chef. Early on, she weaned diners from Dow’s “pollo ai pistacchi,” turning them on to rabbit braised in Arneis wine, an extraordinary dish she doesn’t dare take off the menu. Who should go: Mark a special occasion, ignite a romance or just savor the company of friends and family at a well-laid table. Dishes track the seasons. Though the cooking leans toward Northern Italian richness, flavors are from all over the Boot, and ingredients might come from anywhere. Australian Wagyu beef made a spectacular carne cruda. The heavily marbled raw meat, coarsely chopped and mixed with finely minced shallot, lemon zest and a pinch of cayenne, is served with crostini, some topped with thin sheets of house-cured lardo. 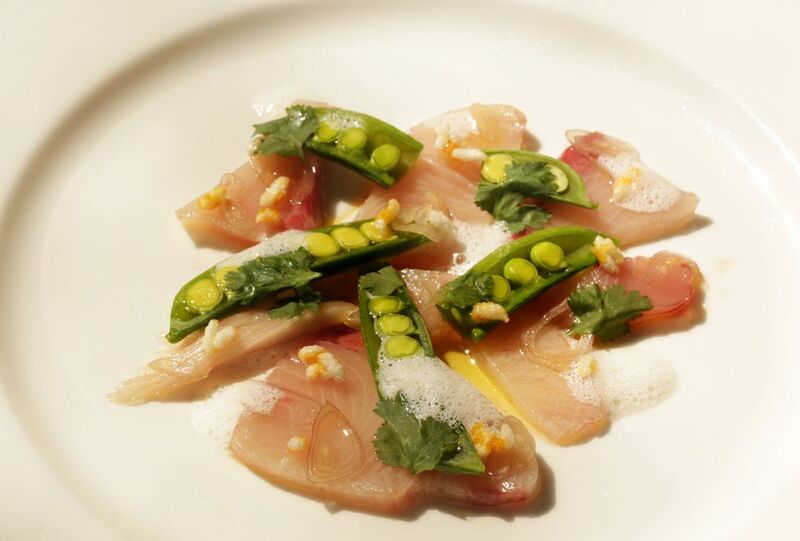 Ligurian olive oil, almond milk foam and colatura, a potent Southern Italian fish sauce, anointed yellowtail cruda, surrounded by coriander leaves, slivered snap peas and crisp puffed rice grains dusted with bottarga, the salt-cured mullet roe prevalent in Sicily. 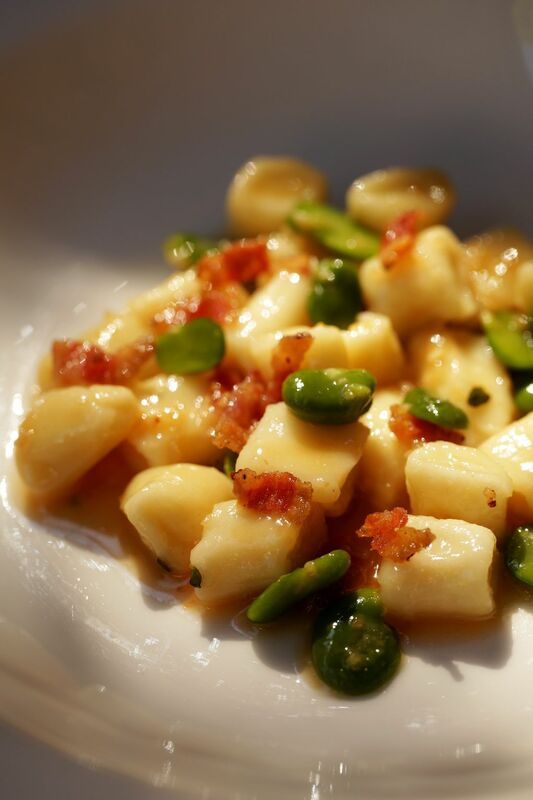 Goat-cheese gnocchi no bigger than the tip of a pinkie nestled amid fava beans and crackling shards of guanciale (pork jowl bacon), sauced sparingly with an intense reduction of butter, olive oil, aromatics, wine and brodo, a complex broth that is a key ingredient in Smith’s arsenal. Oregon black cod, a recent “pesce della sera,” rode a fuchsia wave of beet crema, a thick, whipped emulsion of beets and olive oil that incredibly contains no cream. She repeats that trick coupling pistachio crema with seared foie gras. When rich meets richer, a sharp counterbalance is essential. With the fish, it was a panzanella salad of rye bread, radish and arugula. With the cauliflower, it was cumin, cayenne and a spritz of lime. With the foie gras, it was the sweet and bitter mingling of Bing cherries, ginger and crunchy cacao nibs. That dish came with a side of pan juices begging to be mopped up with herbed focaccia from an array of house-baked breads and crackers. Was that extra just for me, I wondered? As a longtime customer, I am not unknown here, but everyone gets the drippings, just as everyone enjoys the attention of servers who work with practiced synchrony. Anyone also may request wine pairings with each course, as I did. Wine director Kyle Brierley was savvy in his choices and didn’t play it safe. With a pungent salad of lacy Ruby Streaks mustard greens, he poured Menabrea Doppio Malto Rosso, a dark Piedmont beer with the right robustness for the greens’ horseradish bite and anchovy vinaigrette. He willingly poured half glasses, too, which helps keep the cost down and the head clear. Anna Ivers’ desserts (like her breads and crackers) rise to the high standards of everything else. Perfect vanilla panna cotta quivered beside a pool of Tuscan honey. Invigorating espresso granita accompanied tiramisu leggero that was indeed light. From aperitivi served with matching little bites to dainty biscotti, Cafe Juanita maintains a level of excellence rare in these parts. Food and service deserve four stars. But the Riedel stemware and fresh flowers can’t disguise that the 62-year-old house “needs some love,” as Smith says. Soon it will get some. Fourteen years ago, Smith bought the business; now she’s buying the property. Plans call for an expansion by spring 2015 that will include a full bar and other upgrades. A fourth star should be within reach then.